So you rock up to a wine tasting, do the swill, take a sniff, have gurgle – now what flavours do you get? Um…wine-y? Fear not. We’re here to arm you with a couple of key wine descriptors to ensure you can look the part and never get caught out by the wine lingo. We know we’re advocates of #LosetheLingo but sometimes a little bit is all you need to impress. Tannin? Not in this weather surely. This is probably one of the most thrown around words in the wine world – we’ve all heard it, but have probably never used it. Well here is your chance to slip it in there the next time you’re tasting red wine. So how does a tannin taste? Well it’s quite bitter and dries out your mouth – kind of like putting a black tea bag on your tongue. So the more over-strewed tea the wine tastes, the higher the tannins. Nailed it. Some tannins are a bit more rounded and not so drying, which is a good thing. But it can be down to personal taste. Tannins also mellows out over time so older wines generally get smoother. Oaky finish. Is that floor cleaner? 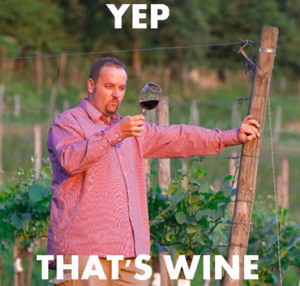 If you’ve heard about tannins, you’ve probably heard about a wine being ‘oaky’. It’s used to describe the flavour that oak gives the wine, which could be from oak-ageing in barrels or oak chips being used in the making of the wine. You’re not looking for tastes of tree bark with an undertone of freshly cut grass however. In fact it adds vanilla, dill, coconut and even butter to the taste. Almost like a cookie. Kind of. This isn’t a word with double meaning, it literally means the wine is rich, luxurious, smooth and bold. If a wine seems to flood your mouth with layers of flavour, we’d give this word a shot to describe it. You’ll sound well fancy. You know that face you pull when you bite into an un-ripe apple? If a wine makes you do that you can safely describe it as tart and probably move swiftly on to the next glass. That is all. Full Bodied. I think you’ll find the word is curvy. This describes the weight of the wine in your mouth and the general rule of thumb is the more alcoholic the wine, the more full bodied. Wine will either be light, medium or full bodied and is often compared to the feeling of skimmed, semi skimmed or full cream milk in your mouth. So if the wine feels like it’s coating every inch of your mouth, it’s probably a fuller bodied wine. If you can’t remember the description, go for semi skimmed milk and share the reactions with us.